DTM Rambles...: 3526 - Giants. Mengs. Deformed Hands I Can't Erase. 3526 - Giants. Mengs. Deformed Hands I Can't Erase. 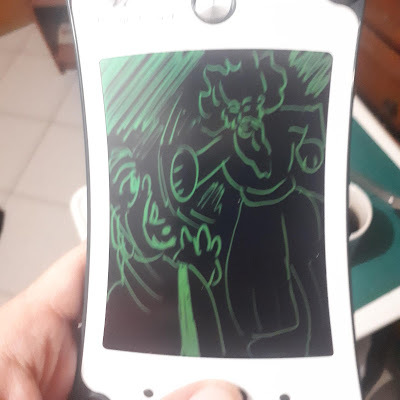 Another Boogie Board doodle... and one that demonstrates the weakness of this device, as a couple mistakes that could've easily been fixed with an eraser is not so easily removed from the image... without killing the whole image. In any event, this was my attempted Meng Vs. Giant doodle. It's not great, but makes me want to watch that match on Youtube.